V-79-57344-4608 – The backup-to-disk folder that was specified for this job must be on a local NTFS volume. Create a new backup-to-disk folder on a local NTFS volume or modify the current folder, and then submit the job again. In my case the problem was because I was backing up Exchange (2003 on an SBS 2003 server) and it had the GRT option enabled. (Though in these older versions of Backup Exec they didn’t call it GRT). With Removable Backup to disk Folders you cannot use GRT. Sorry either use a tape or a normal backup to disk folder. And that’s for Exchange, Active Directory and Sharepoint. 1. 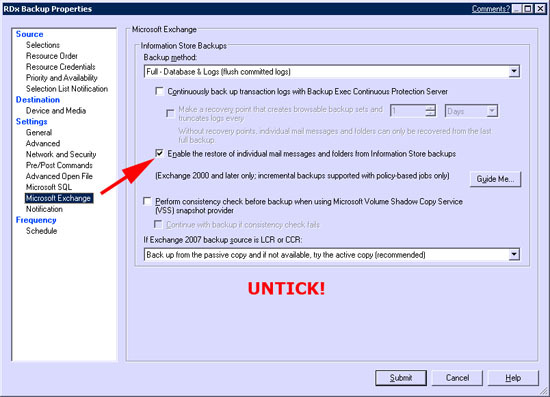 From within Backup Exec > Tools > Options > Microsoft Exchange > Remove the tick from “Enable the restore of individual mail messages and folders from Information Store backups” > OK.
2. That’s fine for all NEW jobs but if you already have your backup job create you need to edit it. 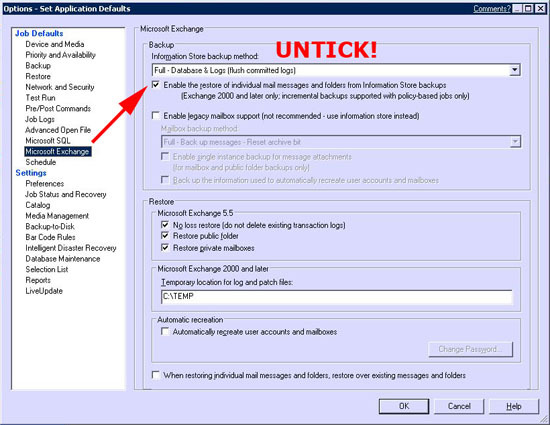 Navigate to Job Monitor > Right click the relevant job> Properties > Microsoft Exchange > Remove the tick from “Enable the restore of individual mail messages and folders from Information Store backups” > Submit > OK.